Bill James introduced his formula for predicting a team’s expected winning percentage (Expected W%) for a season. The formula is Expected W% = (Runs Scored)2 / [(Runs Scored)2 + (Runs Allowed)2] and is called the Pythagorean Theorem of Baseball. Bill James’s rationale for his theorem was that the number of runs a team scored (RS) compared to the number of runs allowed (RA) is a better indication of a team’s performance than their actual win-loss record. Of course, this reasoning is the antithesis of Bill Parcells’ quotation “You are what your win-loss record says you are.” Let’s say a team is 45-37 at midseason but based on James’ formula their Expected W% was at or below .500. It might be predicted that as the season moves toward the end their win-loss record will also move in the wrong direction. My current research done with the help of Kevin Faggella, a math major at QU, introduces a new alternative formula to Bill James’ formula to accomplish the same goal. My formula is Expected W% = .000683*(RS – RA) + .500 and is called the Linear Theorem of Baseball. This formula is developed by applying the statistical techniques of linear regression and correlation analysis to the sample of MLB years 1998-2012. 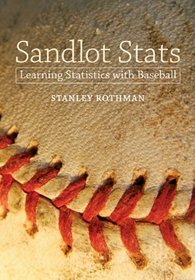 For those interested in learning these important mathematical tools and seeing the derivation of these theorems go to Chapter 5 of Sandlot Stats. In fact, my Expected W% formula would have correctly predicted the fate of the 2005 Washington Nationals. On July 5, 2005 the Washington Nationals were in first place with a record of 51-32 having RS = 340 and RA = 340. According to my formula their Expected W% = .000683*(RS – RA) + .500 = .500. This clearly sent a message about how their season would end. In fact, their final record for 2005 was 81-81 with RS = 639 and RA = 673. Let us now look at the midpoint of the 2013 season and use my formula to make predictions on which teams will make the playoffs. Using 90 wins as the milestone for a team to either win their division or become a wild card, this equates to a final record of 90-72 and a winning percentage of (90/162) = .556. Using my formula, we have .556 = .000683*(RS – RA) + .5000. Solving we get (RS – RA) = 82 (rounded). Of course, one might choose 95 wins or some other amount instead of 90. 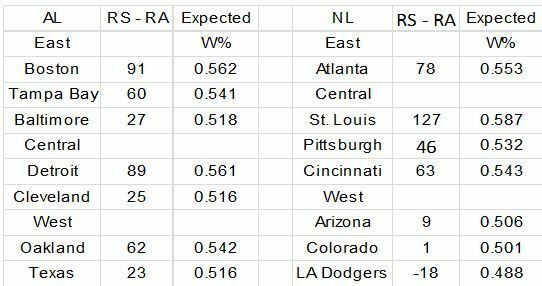 Based on the closing records before the 2013 All-Star game and using my formula, I created a table of all the teams whose Expected W% = .000683*(RS – RA) + .500 is now greater than .500. I also included the Dodgers because they finished the first half winning 18 of their last 23 games. Using this table along with other data, these are my playoff predictions for 2013. First, the division winners are for the AL-East Boston, for the AL-Central Detroit, for the AL-West Oakland, for the NL-East Atlanta, for the NL-Central St Louis, and for NL-West the Dodgers. My two wild-card choices are for the AL Tampa Bay and Baltimore or Texas (a tossup) and for the NL Pittsburgh and Cincinnati. I pick Detroit for the AL-Conference winner and St. Louis for the NL-Conference winner. The last time Detroit won a World Series was in 1984 under the leadership of Sparky Anderson. Detroit’s current manager Jim Leyland managed the 2013 All-Star game to win and the AL won. Yes, with the help of home field advantage the Detroit Tigers will win the 2013 World Series. Sadly, I predict my beloved Yankees will be on vacation during the playoffs. Thank you Dennis for your compliment. I just looked back at my posting on July 23 and it seems like all the teams I predicted to be in the playoffs have an excellent chance of making it.I believe that after a certain number of games looking at the difference between runs scored and runs allowed instead of the win-loss record can give a better prediction of a team’s final record. My new formula seems to work and can be used at any point in the season. Stan- looks like you are spot on with this formula. Very interesting that you found the Dodgers shooting up before most fans or media!